An american flag hangs in front of the Harveyville church after the Feb. 28 destroyed it as well as several homes. The community celebrates those who helped usher in its recovery at this weekend's fair. 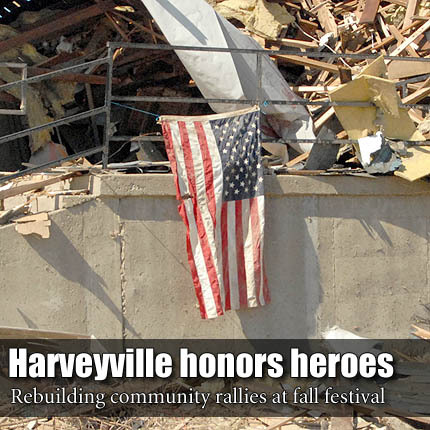 HARVEYVILLE—Heroes help make recovery possible. Harveyville was stricken by tragedy when a Feb. 28 tornado destructed the rural Wabaunsee County community, leaving one citizen dead. Within seconds of devastation, assistance arrived from unbeknownst and has continued coming until much of the town’s damage has been restored. There is no shortage of appreciation from the townspeople, and they’re doing their small part to say thanks during the 75th Annual Harveyville Fair with the theme “Heroes Near and Far” Friday and Saturday in Harveyville. “We can’t begin to name everyone who came out to help after the tornado, so we have planned our annual Harveyville Fair to pay just a small token of appreciation for all that everyone has done for our community,” said Jana Phillips of the fair’s promotion committee. “The challenge is narrowing down who you call a hero. We were, and continue to be, so blessed here in Harveyville,” said Dustin Kuntz, who co-operates the Harveyville Seed Company with his father, Chuck Kuntz. “It is almost impossible for me to rank in my mind the relevance of the sacrifices that were made and given here. Kuntz also recalled more than 1,600 volunteers who flooded the town with aid over four days following the tornado – a figure that does not include local and emergency personnel. “Another great story is the Methodist church as they are continuing to serve the community with a food pantry and ministry without a building. I find it inspiring that, despite not having enough money to rebuild, they are still giving to others first. It really touches my heart, obviously,” Kuntz said. “That’s why we want to recognize everybody this weekend as well as all the other heroes, including those in the military serving our country, so we can have our precious freedom, and the opportunity to help others when they are in need,” Phillips said. A significant part of the weekend ceremony will be Harveyville Memorial Dedication Ceremony in memory of Rick Slade, who lost his life during the tornado. The tribute will be 12:45 p.m. Saturday. Other events at the fair include a marathon softball tournament, strong person competitions, and the Topeka High Drumline. Attractions include inflatable rides, a petting zoo, frog and turtle races, an operating train, Peaches the Clown and a scavenger hunt. See related story for schedule of events. “We want to recognize all of the heroes in our lives during the fair weekend, so please be sure to invite your heroes to come out and join in the celebration,” Phillips said. 10 a.m. - noon Dr. Jenny Howe, DVM- Teeth, Toenails & Toxins: Quick Tips for your Pet (2).